Heat up a pancake (for a quick version, use Pillsbury™ frozen original pancakes). Spread marshmallow fluff on one half of the circle and peanut butter on the other. Then, fold it over and enjoy. Like most kids, mine are head over heels for classic kid sandwiches like PB&J and fluffernutters. But why serve them on boring old bread? This fun variation takes a classic sammie and makes it extra special. Peanut Butter. Marshmallow fluff. A pancake. No, really. 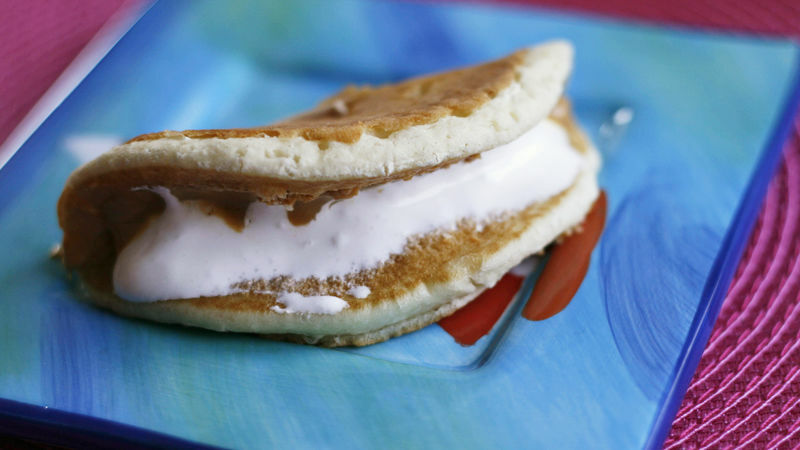 Heat up a pancake (for a quick version, use Pillsbury Frozen Pancakes) and spread marshmallow fluff on one half of the circle and peanut butter on the other. Then, fold it over and enjoy.